Topical Bible for Kids contains Bible verses and short explanations organized by topics. It’s easy enough for children to use as a reference tool or devotional, but it is also ideal for parents to use during family devotions. I wrote Topical Bible for Kids to share the Scriptures that have delighted me since I was a child. As a mother, I am striving to help my children delight in God’s Word, to see the connection between the Bible and their lives, and to use the Bible independently. This book is a way of helping them see in print how lovers of God’s Word return to God’s word when they face a specific challenge or joy. Read an excerpt (ESV or KJV). Order the Topical Bible for Kids in the ESV , KJV, or NASB translation. 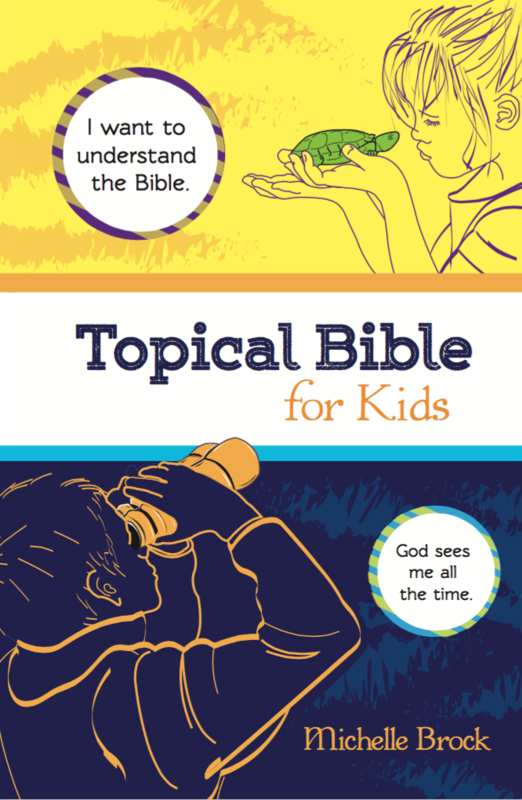 What to do with the Topical Bible for Kids? What are people saying about the Topical Bible for Kids? Create topics that children are interested in, not merely topics parents assign to children as discipline or teaching opportunities. Include search terms children will use, and cross references to help them understand biblical opposites (stealing and giving; pride and humility) as well as synonyms they haven’t learned. Use verses in their entirety, rather than simply use a reference or excerpt. A resource that requires looking up a verse TWICE is discouraging to all but a very few young readers. Order verses by simplicity to complexity. In general, the simplest verses should be first because young readers do not often have mature scanning skills to find a verse that fits their needs. Keep the selected scriptures simple. Children enjoy scripture differently than a mature reader. Babies and children eat small bites. Small statements and partial verses from scripture are delightful for children to think about and settle their questions quickly. Yes, children can memorize long passages, but my goal is to teach them short passages to help them meditate on God’s Word. Avoid controversial topics and verses that have confusing or complex contexts. Babies and children need milk, easily understandable and applicable passages, not because they can’t grasp harder things, but because they need to grow strong on milk first.